The leader of the Indigenous People of Biafra, IPOB, Nnamdi Kanu was on Tuesday re-arraigned before Justice Binta Nyako of the Federal High Court sitting in Abuja. 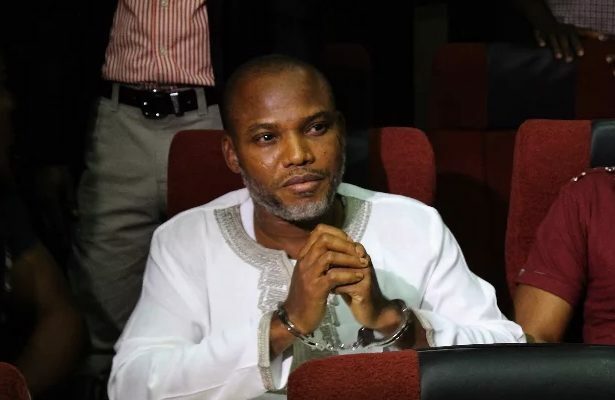 The Federal Government re-arraigned Kanu before Justice Nyako on an amended 11-count charge bordering on terrorism, treasonable felony and publication of defamatory matter, following the withdrawal of the former trial judge, Justice John Tsoho of the same court. Director of Radio Biafra over allegation of bias levelled against him by Kanu’s legal team. Following Tsoho’s withdrawal, the case file was transferred to Justice Nyako. At today’s resumed hearing, Kanu, who was re-arraigned alongside Chidiebere Onwudiwe, Benjamin Madubugwu and David Nwawuisi, however, pleaded not guilty to the amended charges. Against the backdrop of Kanu’s not guilty plea, Nyako fixed November 17 to hear the bail applications filed by lawyers to the accused persons. Earlier, counsel to all accused persons, Chucks Muoma , SAN, Inalegwu Adoga, E.I Esene and Maxwel Okpara, lamented that the prosecution was bent on frustrating the case through unnecessary delay tactics. Reacting to the counsels’ complaint, Nyako said since the case was before her for the first time, she was not interested in what had happened in the past. “The case is coming before me for the first time, so let us start on a clean slate, forget what happened previously,” Nyako said.